Mariel here. In anticipation of the post-Christmas blizzard, I scurried to the local grocery store to stock up on supplies. You know, just in case a crowd of wayward travelers landed on my front door in need of a hot meal. I overdid it – to say the least – and ended up with three pounds of carrots languishing in my crisper. I guess I got caught up in the supermarket hysteria, but at least I didn’t land in the hospital like one of the frazzled shoppers I ran into – seriously. Anyhoo, there’s really only two things to do with three pounds of carrots – roast ’em or turn ’em into soup. Having just dug into Braise-Roasted Chicken with Root Vegetables, I opted for the latter. This is a pretty basic recipe, but since we cater – no pun intended – to home-chefs looking to dazzle their guests on a dime, I gussied it up a bit with candied walnuts (pecans would also work). They add a delicious little crunch that transforms this classic soup into something truly special. Plus it’s totally resolution-friendly – it costs under $5 and is super healthy. If you’re only serving a party of two, this dish also freezes beautifully since it’s dairy-free – just store the walnuts separately. My icebox is now well-stocked in anticipation of Snowpocalypse Part II. Psst: if you’d like a double-dose of beta carotene, serve this alongside our Butternut Bread. Your eyes will thank you. 1. In a small skillet melt the butter over medium heat. Add the brown sugar, stirring well to combine. Add the walnuts and, stirring constantly, sauté for about 10 minutes over medium-low flame until the nuts are fragrant. 2. Transfer to a small dish and allow to cool completely. The glaze will harden during the cooling process. 1. In a large stockpot, saute the carrots in 2 Tablespoons of olive oil over medium-high heat until they soften and start to caramelize, about 10 minutes. Stir frequently to prevent burning. Add the ginger and saute for another 1 minute. 2. Add the low-sodium stock and applesauce, bring contents to a boil then cover, reduce heat to medium-low (or low, depending on your stovetop) and simmer for 45 minutes. You want the carrots super tender. 3. In batches, transfer the soup to a blender or food processor and puree. 4. Transfer the puree back to the stockpot and reheat over medium-low heat. Add the brown sugar, taste the soup and then season with salt and pepper. Simmer through for 5 minutes and then serve hot, garnished with Candied Walnuts. Awesome recipe- something I would never come up with on my own… you sold me at candied walnuts! Trying to burn out my immersion blender this winter, so this will come in handy. Thanks! Nice to hear that I’m not the only one who was a little excessive at the grocery store. 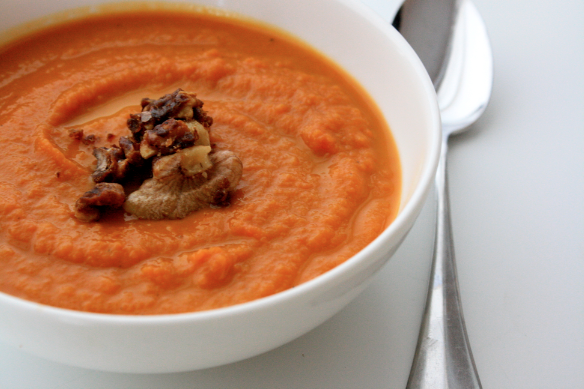 The pairing of the candied walnuts with the carrot soup; I can virtually taste it! Plus a healthy start to the New Years! My husband is allergic to walnuts and pecans. Is there a garnish alternative you can recommend for the soup? Of course! You could easily candy (unsalted) sunflower seeds or roast pumpkin seeds (or butternut squash seeds) then candy them as described in the recipe. If you wanna totally steer clear of nuts/seeds, buy fresh chives and just snip a few over top before serving. candied nuts are the best! love the photo – so vibrant!